The perfect wallet for making single-handed contactless payments, no need to take your bank card out to pay. Smooth, quick and effortless. Our mission is to make contactless payments ‘effortless‘ and keep you safe from RFID identity theft. Our wallet not only protects your contactless cards, it’s innovative design means your contactless payment cards need never leave your wallet. Just slide out to use and then retract. 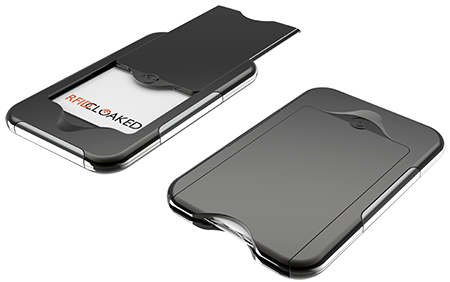 Uncompromised security by RFID protection for your cards. Designed for single-hand use, perfect for travel or when on the phone. Fits perfectly for left and right-handed users. Measures just 8.5mm x 114mm x 73mm — or, as thin as your average mobile phone. Unlike some other slim wallets, what you put in it will not change that fact! Our wallet has been designed from the ground up, specifically for use with contactless cards. We wanted it to be fit for purpose, not simply an adapted traditional wallet with added RFID protection. The Wallet has 2 sliding drawers for contactless cards and an internal slot (which is also protected) for either train/parking tickets or up to two further ID cards or bank/transit cards. The hard work of designing the perfect wallet is behind us. Thousands of personal hours and some initial development costs have got us this far, but, we really need the support of people like you to get us over the line so that we can finally bring our wallet to life. We have chosen Kickstarter to launch our wallet because we have a proven track record of delivery from our previous campaign. We would love to make this wallet for you, and, with your confidence in us, and with your pledges, we can make that happen. We are RFID Cloaked. Meet the team behind the hugely successful Contactless Blocking Card, funded on Kickstarter in 2016. We’re back on Kickstarter now to launch our innovative new wallet. Reuben’s expertise is design and digital media. Trained as a photographer, graphic designer and now a digital media professional, working currently in corporate communications for public sector, dedicated and forward thinking.